1 BROWN ground beef in 12-inch nonstick skillet over medium-high heat, stirring occasionally; drain. 2 STIR in onion, red pepper and celery. Cook, stirring occasionally, 3 minutes or until vegetables are crisp-tender. 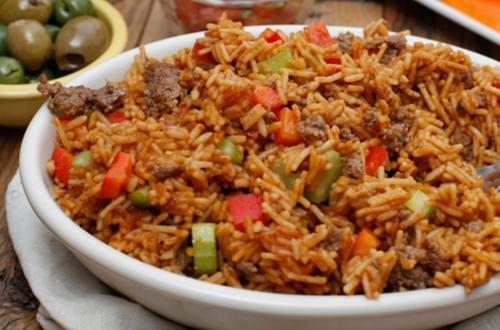 Stir in Knorr® Cajun Sides™ - Dirty Rice and cook, stirring frequently, until rice is lightly toasted, about 2 minutes. 3 ADD water and bring to a boil over high heat. Reduce heat to low and simmer covered until rice is tender, about 7 minutes. Serve with hot pepper sauce; now it's delicious. Dig in!